Most pool heaters tend to be installed at the back corner of the property along with the noisy pool pump. Pool heaters are large BTU appliances. When piping gas to a pool heater, large piping material is required to minimize the pressure drop across the long run of piping. The longer the piping system the bigger the diameter of pipe required for the installation. 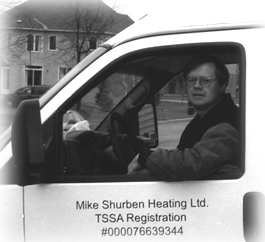 It may be advantageous to size the heater slightly smaller, if possible, to save costs on the piping installation. The pipe trenching must be at least 15 inches below grade and cannot run under any structure. The main factor that determines the heat loss of the pool is the wind and amount of pool surface area. Winds cause evaporation, and it is the evaporation of water that removes large amounts of heat (latent heat of evaporation) from the pool. Solar blankets are highly recommended when the pool is not in use which is generally at night or on a day that is unsuitable for swimming. Perhaps they should really be called lunar blankets! 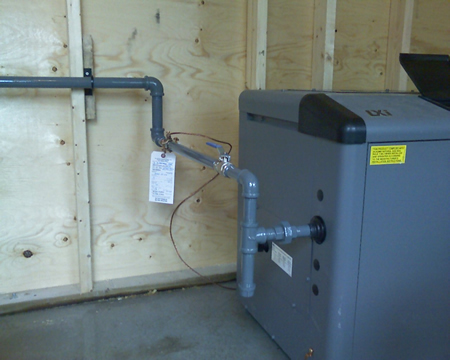 The following images are of a pool heater installation inside a shed. Notice the stability of the piping to the heater and the convenient location of the valve handle. 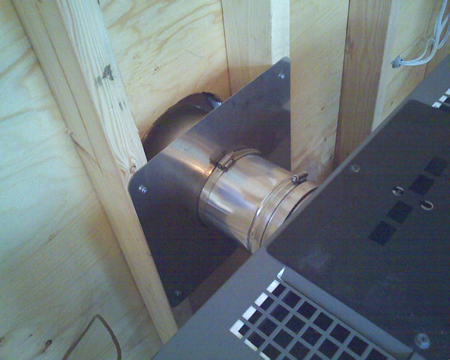 The rear venting is also secured well and the material used is stainless steel with quality fasteners.